This is just gorgeous! I have been a fan of Ms Dare’s work for a while now, so I knew even before I picked this up that I was going to be in for a treat, and oh, boy! What a treat! This is laced with every emotion that you can think of, it is a ‘Marriage of Convenience’ both characters never went into this marriage with love in their minds they both wanted something from it, he an heir and she to help. But it becomes so much more than that, you know that as soon as the story open’s that there is something very special going to happen with these two and there does. It is as ever so beautifully written, it’s full of angst and the story builds and builds just as the sexual tension between them does until it comes to a too romantic to be true climax. Tessa Dare has a real skill with writing wounded character’s that make you all in love with them and this is by far one her best. Seamstress Emma Gladstone is on the brink of destitution, her rent is due, and she knows that this time if she can’t pay she will be on the streets. She is desperate she will never go home and beg too much has happened for her to do that – there are too many skeletons in her dark closet, so she does the only thing she can to get the money she needs. Donning the wedding dress, she had been charged to make – the very dress that after hours and hours of pain and expense to make hasn’t been paid for – she goes and bangs on the door of the man whose bill it is to settle; the mighty Duke of Ashbury! But, the Duke has other ideas instead of settling up like a gentleman he gives her a choice – the full amount of what she is owed, there and then in cash or she marry him! Emma can’t quite believe that he has asked her such a thing, and more than that his adamant that she will accept him. Especially when he turns up at her work – that is such a great scene – actually braving the outside world to come to her and basically tell her that she will be marrying him. Due to personal reasons, not just the fact that she is desperate but also the fact that by marrying the Duke she can help a good friend to avoid scandal, she does marry him – but after he has given her his own conditions of what would happen in their marriage, she presents him with her own conditions. Conditions to their marriage that not only shocks her by confessing her deepest wishes to him, but also shocks him too that she isn’t as pliable as he first thought her to be. Ash is needing an heir, he knows that he has to have an heir otherwise his title would pass on to another branch of the family – one he was determined that wouldn’t have his title. So when he first sets eyes on Emma, he is on the verge of asking his man of business to make arrangements to find him a bride when the unbelievably beautiful and proud to a fault woman barges into his office demanding a measly sum of money for a grotesque dress, he knows there and then that he has found his Duchess she is exactly what he needs. She is young, healthy and more importantly she is right there. He knows deep down she will accept him, how could she not? After all she is in need of money and he is a Duke, but he is quite taken back when she does accept him …but with conditions of her own! Ash is such a fragile man, since he came back from the war severely scarred he has become a sort of recluse, he is ashamed of his appearance he thoroughly believes that no woman would ever love a ‘beast’ of a man like him, so he keeps himself locked up in his big house, becoming more and more depressed. I do like a vulnerable man and Ash is the epitome of vulnerability, he is a brooding hunk of a man that does really need some goodness in his life, he needs to feel loved and he needs to be treated like the good and sensual man we all know he is. This is where the kind, patient and strong Emma comes in, she is exactly what he needs – whether he knows it or not! I absolutely love the very first scene, when Emma turns up at the Dukes house wearing a wedding dress she has made for his latest lady and demanding payment for it. In that first introduction to Emma you see a strong woman who won’t take no for an answer she is determined, somewhat stubborn, she has got just as much pride as him and she has no intention of leaving his house without payment for the hour’s and hours work she has done on this dress. He pushes and pushes her as he does with everyone, but this little seamstress is unnerved by his demanding presence she, is determined not to be refused. For me those first few pages, that one scene when they meet shows you exactly what these two are about. You know instantly that under both their too proud and business-like exteriors there are wounded hearts that need love and that love is standing right there in front of them. It is terrific intro to both of them and gives way to so much more. I love this, it’s so romantic and it is a hugely satisfying read. The plot is a simple ‘Marriage of Convenience’ trope where the hero and heroine after a bit of a to-ing and fro-ing they finally get their HEA, but for me what really makes this is Emma and Ash’s budding relationship from the very first moment we meet them you just know that there is something special with these two, the way she brings him back from his dark place and makes him live again is really beautifully done. I cannot recommend this enough, it is definitely a must read and one that will be read and re-read over and over again. This was a complimentary cop via Mills and Boon as apart of this blog tour in exchange for an honest review. The rapping only grew louder. More insistent. the door just an inch. she knew him at once. Only one man would have behaved in such a presumptuous manner. Emma closed the door and turned the key. There was nothing else to do for the moment. She couldn’t leave it ajar and risk being seen alone with a gentleman. Good heavens, what could this man be after? Was his mockery yesterday not enough to satisfy him? He couldn’t actually want to retrieve Miss Worthing’s gown. There. Surely he would retreat from that. actor on a stage, expecting applause. Emma retrieved her measuring tape. She’d begun this little farce, and she couldn’t back down from it. 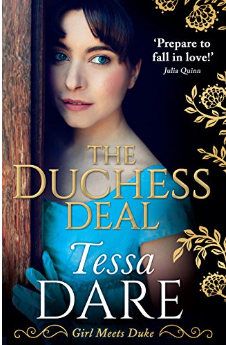 This entry was posted in Blog Tour, Complimentary copy, Exclusives, Historical Romance, Mills and Boon/Harlequin, Regency, Reviews and tagged Blog Tour, Complimentary copy, Harlequin, Historical Romance, Mills and Boon, Review, Tessa Dare, The Duchess Deal. I’m a huge Tessa Dare fan too, Frankie, and absolutely love her books. I had the pleasure of meeting her in person at HRR in 2016. How amazing!! 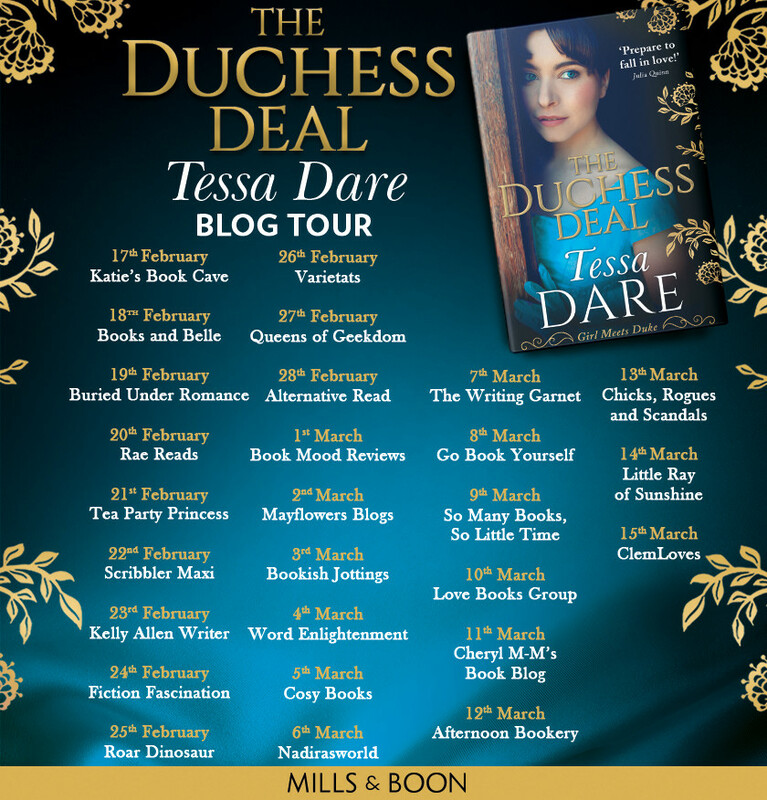 I do love Tessa Dare’s book’s, they are just wonderful and this is a brilliant edition to her CV.